I will not exaggerate when I say that this is by far my kids’ favorite Christmas activity to date! Every year, without fail, when I ask them if we should choose something different and new for our Advent, the answer is always a strong “No! 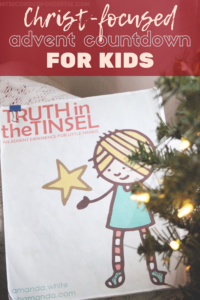 We want to do Truth In The Tinsel again!” And so we have stuck with it for years, only now, when my kids are 8 and 11, guess who is leading the study and activities? That’s right, my kids do! 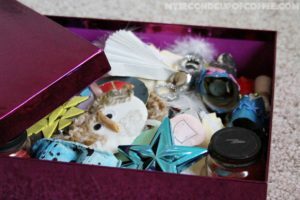 They take turns preparing each day’s message, reading the passages from the bible, asking and answering questions, and digging out our ornaments from the big purple box where we store all our supplies. In some way, it has become easier on me as parent, and when I struggle with thoughts of maybe doing something more challenging for their age, I am reminded that the Bible is a true living word. Each year, when we read from the scriptures, same passages again and again, something wonderful happens. Our kids discover the new meaning of something that they can apply to their lives at this particular age or stage in life. They discuss things on a different level each year that they grow, and we all have a slightly new experience as a family. Even though it is designed for the kids, it is NOT a trite and watered-down Christian-ish study. On the contrary, it is an amazing Christ-focused advent countdown for both adults and kids. It makes you think and dig deeper when you read the familiar passages from both the Old and the New Testament. The passages provided for each day are relative to the topic and are not too long that the kids loose attention. Each lesson points back to Christ and His gift for us. 2.It LASTS FOR 24 DAYS. I find it very convenient and easy to start on December 1stand finish on December 24th.. Each day of this Christ-focused advent countdown is pretty concise. You can take as long as you want to complete it. Some days, when we had to skip a day due to a trip or family gathering, we easily could catch up the next day and do 2 lessons at once. All days follow a common theme of Christ being the Savior. It is so neat to see the kids making connections from the Old Testament to the New. Now, whether you are crafty or not, the ideas provided for each day are super easy. The e-book has a supplies list, and please let it not scare you with its length! After looking through it the 1sttime, I realized that I already owned a whole bunch of supplies. The rest I could easily substitute with something else. 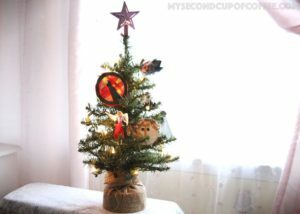 Each craft will become an ornament for your tree or a small Advent tree if you choose to do that. We have purchased 2 small lit-up trees and put them in my kids’ rooms. Each day, after our Christ-focused advent countdown study, they place an ornament correlated to the day on their own tree. We only did crafts once, during our first year doing Truth In The Tinsel countdown. My kids were 2 and 5, and they had a blast! 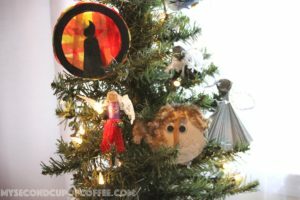 We since have simply reused their crafted ornaments each year. Crafts really add to the experience and help kids remember the lesson. But if wanted to skip that part, you certainly can! The cost for the Ebook is only $9! You can purchase Truth In The Tinsel here. You can either print it at home (about 30 pages) or have it printed at Staples. However, you can also have it on your electronic device, such as a your phone, tablet, or computer. The choice is yours. You can do this study when you are home, when you travel for the holidays, when you have a friend over and turn it into a crafty playdate, etc. You don’t have to do it at a particular place or time. In the past, we have split the Bible part and the craft part and did them at separate times of the day, when it was the most convenient to us. Also, you can customize your study by using supplemental materials. Here is the FREE Truth in the Tinsel Supplements post that was super helpful. It has a lot of sources of how other people created extra activities to go with the study and made it unique and fun for their kids. One year, we did printable ornaments and another year we made the Advent Tracing Cards and made them into mini-books. We have also used the Countdown Riddle Cards. Lego Ornaments idea seems like it could be a lot of fun, but we have yet to attempt it! Ok, so you definitely need to make an effort here. You’ll need to gather supplies, prepare for the lesson, set time aside for crafting, but…the hard part has been done for you! 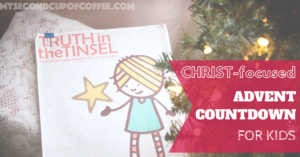 If you feel nervous and not very confident about teaching your kids about Christmas based on the Bible, this advent countdown will show you the ropes! I can almost guarantee you that after doing this study with your kids, you will feel empowered and more confident in your teaching skills and knowledge. When I say it’s easy, I mean that in Truth In The Tinsel, Amanda has already done everything for you. She found the scripture passages for you to read. Plus, she has come up with how to talk to your children about the topic by providing a sample text. This is huge when you are just not sure how to even start. And she has prepared discussion questions at the end, too. 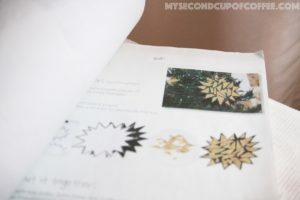 All crafts have supplies listed and instructions provided, often with process pictures. Seriously, all you will need to do is purchase the e-book, pray over your study, of course, and just dive in on December 1st! 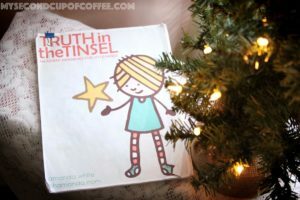 If you are looking for a new fresh way to share the Gospel with your children this Christmas season, please check out Truth In The Tinsel! It is a treasury of Biblical truths told on your child’s level with multitude of crafts and activities that are designed to enhance your experience. This Christ-focused advent countdown will surely become your favorite Christmas tradition as well! Note: At Easter, we use A Sense of the Resurrection Study by Amanda White. Check out my post A SENSE OF THE RESURRECTION: AN EASTER BIBLE STUDY REVIEW to read more about it. Do you do Advent Countdown with your children at Christmas time? If so, what other Advent studies/activities have you done? Share in the comments, I’d live to know!